Kakadu plum also known as Billygoat Plum or Gubinge is a flowering fruit that is found commonly in Northern Australia and is a store house of vitamins, antioxidants and many other nutrients. It is the highest source of Vitamin C and has lots of health benefits. It is also beneficial for your skin and the hair and is included in many of the skin care products and the hair care products. It also has antiseptic properties. The extract of kakadu plum fruit is rich in Vitamins C and E, folic acid and carotenoids, which reverses the effects of free radicals and reduce the symptoms of ageing. It also helps in reducing dark circles and the puffiness under the eyes. many of the anti ageing products contain extracts taken from kakadu plums. The high content of Vitamin C present in kakadu plum makes it an effective remedy for the treatment of pimples. it helps in clearing the bacteria responsible causing pimples on your face prevent the appearance of pimples in future. If you just mix kakadu fruit with some clay and apply the mixture on your skin. Let it remain on your skin for about 20 minutes and then wash off with water. This will flush off all the impurities and makes you skin clean and provides it an even tone. Using this face mask once in a week helps you to get rid of pimples as well as other spots on your face. It is also good for healing blemishes and provides a smoothening effect to the skin. When you spend more time in the sun, it may cause damage to your skin due to the presence UV rays in the sun. Ageing also case your skin to get damaged and cause the appearance of fine lines around the mouth and the eyes. The antioxidants present in kakadu plums help in repairing the damage thus caused. It enhances the production of collagen and helps in removing fine lines and scars formed on the skin and makes it healthy and young looking. The gallic acid present in this fruit acts as an astringent and also fight against bacteria, fungi and virus. 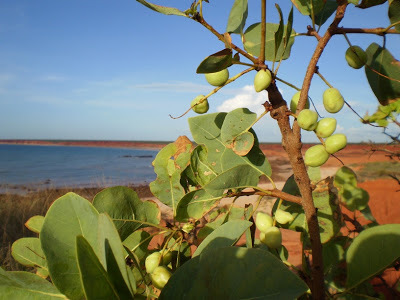 Many of the skin care products for men contain extracts of kakadu plums. Most of the cleansers, exfoliators, toners, serums, moisturizers and creams that are used by men contain kakdu plums. Being a rich source of Vitamin C, kakadu plums form an important ingredient in many of the skin care creams, masks and lotions. Using it makes your skin glow naturally. it acts against the free radicals formed on your skin and protects your skin from the harmful effects done by them. You can prevent symptoms of ageing on the skin by using kakadu plums. Those who have a sensitive skin are more prone to skin infarctions than other people. Infection of the skin causes itching, redness, rashes and even lesions in extreme cases. So you need to treat it without any delay. The inner bark of kakadu plum has the property to cure many skin infections and other problems of the skin. Its bark is also very effective in treating sores and boils and in healing wounds. Various fungal and bacterial infections are also treated by using the bark of kakadu plums. It is also very effective in treating psoriasis. kakadu plum is a great moisturizer and keep your hair hydrated. it helps in maintainoing the levels of collagen and elastin in the body, which provides you a healthy hair that is strong and lustrous. this hydrates your hair instantly and also helps in detangling your hair easily. Many of the shampoos that promise to treat dry hair problems contain extracts taken from this fruit and helps in moisturizing your skin. Using them regularly provide you smooth and soft hair with a healthy glow. Vitamin C is an excellent antioxidant and is found in plenty in Kakadu plums. It helps in slowing down the process of ageing by reversing the harmful effects of fre radicals formed in the body. Proline, an amino acid that helps in the production of collagen, is also formed with the help of Vitamin C present in kakadu plum. So, kakadu plums are used in a number of skin care products and help you to solve many skin problems. Kakadu plum is rich in phytochemicals like ellagic acid and gallic acid. Gallic acid fights against bacteria, virus and fungi and also has anti-inflammatory properties. It is very effective in treating tumors and problems of the bronchia. Ellagic acid fights against the carcinogens in the body and helps in providing you healthy tissues. This is considered as the most effective property of kakadu plums. kakadu plus is rich in fiber content and also in soluble carbohydrates. This helps in the preservation of Vitamin C, which is essential for digestion and also for absorption of the digested materials in the gut. The fiber present in the fruit improves proper bowel movements and prevents constipation. so, if you are suffering from any problems related to digestion, consume kakadu fruits regularly and you will get relief. By including kakadu plums in your daily diet, you can successfully lose weight. It contains antioxidants that act against the fat cells in the body, thus helping in losing weight effectively by burning the extra calories you have taken in. so, if you are planning a diet to lose weight, include kakdu plums in the diet.. It also helps in treating metabolic syndrome (MetS), which responsible for causing hypertension, obesity and for preventing proper glucose and insulin metabolism. MetS in turn leads to diabetes and diseases of the cardiovascular system. As you have found the various benefits of kakadu plum, try to include this fruit in your daily diet and stay healthy and fit.